T he unveiling and opening of The SSE Hydro in Glasgow is a terrific piece of architecture in more than one sense of the word. It’s futuristic, alien to most designer’s look, and signals a statement of intent from the city to be recognized in the development of modern music entertainment arenas. The Hydro’s beam from the unique inter-changeable outside lights will definitely not only attract local punters to the arena but also global stars to perform for the Scottish faithful. The SSE Hydro is a spaceship that has already taken off. A steep price of 125 million was the cost of production for the Hydro; however the pedigree that it will bring will override the cost. It is the first arena to be built to solely focus on delivering a great arts performance. For this reason the building is faultless. As noted by John Sharkey, chief executive of Hydro owners SEC making the point: “The Hydro is an amphitheatre not because it looks cool but because it gives everyone a great view, the concrete, glass, seats – they are all on a curve so every seat is pointing to the stage in a bowl shape.” Meaning no matter what ticket you get for this venue; seating or standing; cheap or premium – you are sure to enjoy your visit. Visits are what it will bring. 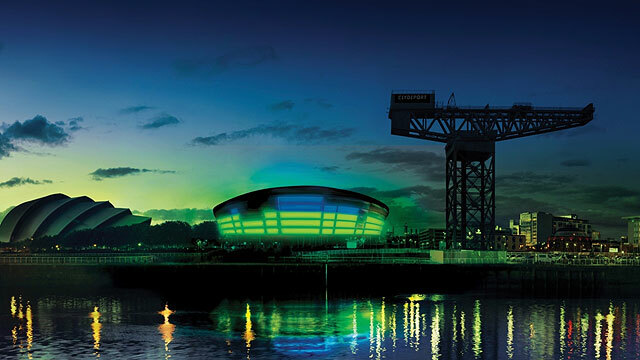 The Hydro allows Glasgow to punch above its weight. How often do we hear of promises of UK Tours from our favorite artists but they do not even reach the border of Scotland and their UK tour turns into a London Tour? “Too Often!” The Hydro shouts back! Within weeks of opening the list of acts booking their place on the stage is staggering. Rod Steward, Fleetwood Mac, Bruno Mars, Katy Perry and Calvin Harris are lined up to perform. Arguably the biggest announcement was the US multi award winning and number 1 grabber pop star Justin Timberlake. Tickets reaching over 100 pounds were snapped up resulting in an enviable extra date. An incredible achievement for a venue in a small nation like ours! Moreover, The Hydro is not a mono-functional building. Comic acts are getting in on the hype. I was privileged to be at the first of its kind and leading cockney comedian Micky Flanagan praised the arena saying it was a ‘joy’ to perform in and would glorify it to other comics. This perhaps why fellow Londoner Jack Whitehall will be arriving in March! So for people of Scotland now is the time to pen these dates in your diary and start saving for many nights at the SSE Hydro! Furthermore, not only will the improvement of the music and arts scene in Glasgow bring more acts to the city, it puts the city on the map. There is reason to think Glasgow is a city thriving and growing at a serious rate. Without doubt, The Hydro is the key to unlocking many of these traits as when comparing to cities closer to home, there is no real competition from the capital Edinburgh. At this current time the capital cannot compete, its arenas and conference venues are not up to the same standard. It begs the question is Glasgow more of a cultural and arts capital than Edinburgh? Posted in Features and tagged Glasgow, Music, Scotland, The Hydro. Bookmark the permalink.